Before we had kids, my husband and I loved to travel together. As juniors in college, we studied abroad in Russia. Ever since then, whenever we've gotten the chance to go somewhere, we have. One of my fears in becoming a parent was that we'd stop traveling; that traveling with kids would simply be too hard. As it turns out, traveling with kids is hard. But my husband and I still love to travel. In fact, our desire to travel might actually be stronger than it's ever been. We long to share the beauty of the world with our daughter. What's more, we believe that one of the best ways to combat racism is to introduce our daughter to other people and cultures. So when we got the opportunity to go to Africa last month for a research project I'm working on with Arbor Research Group, we went... And we took our two-year old daughter with us. 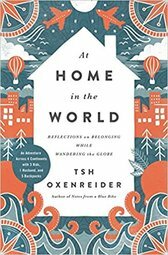 While traveling, I devoured Tsh Oxenreider's book, At Home in the World: Reflections on Belonging While Wandering the Globe. Having enjoyed Tsh's Notes from a Blue Bike, I was excited to read her travel memoir, especially since she wrote it while traveling the globe with her three young children. In At Home in the World: Reflections on Belonging While Wandering the Globe, Tsh devotes a chapter to each of the different places she and her family visited on their worldwide tour. She writes honestly about each place, sharing its beauty but also sharing the difficulties she and her family experienced there. In contrast to travel memoirs that feel removed from the ordinary lives of most people, Tsh's At Home in the World: Reflections on Belonging While Wandering the Globe will leave you inspired to journey out – with or without kids. It'll leave you feeling as though it's possible to travel – at any age or life stage – and convince you that traveling is worth it. As Tsh writes in France, “Passport stamps became icons for gathered wisdom. Every time we crossed political borders, we collected more conversations, more honesty, more willingness to take risks.” That, in a nutshell, is why my husband and I travel with our daughter. After reading At Home in the World: Reflections on Belonging While Wandering the Globe, I can't wait to see where our journey takes us next.